Reduced tolls for the Severn crossings that link England and Wales are now in effect. From today (January 8th), cars will be charged £5.60 to use the bridges, instead of £6.70. Small buses and vans will now pay £11.20 – previously £13.40 – while charges for lorries and coaches have dropped from £20.00 to £16.70. These reductions are due to the VAT element of the current tolls no longer applying ahead of the crossings reverting to public ownership before the end of 2018. 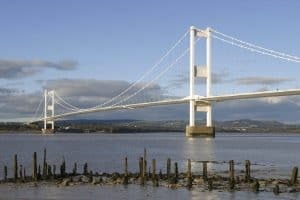 Naturally, company vehicle drivers and fleet operators using the crossings will enjoy immediate savings, and with roughly 25 million journeys made across both bridges every year, the move is set to benefit the Welsh economy by around £100 million a year. That said, the Road Haulage Association remains cautious about the reduction and eventual scrapping of the Severn crossing tolls. While the cost savings are an undoubted win, the concern of the trade association for road transport and freight logistics operators surrounds the impact on traffic management. RHA chief executive Richard Burnett explained: “Hauliers operate to very tight margins so any measures to reduce their costs is welcome. The eventual removal of tolls will be a tremendous boost to the local businesses and haulage firms who rely these major routes. Mr Burnett went on to say that hauliers and businesses need reassurance that the necessary steps needed to maintain smooth traffic flow are put in place as the deadline for the end of tolls approaches. “If the roads can’t cope then any potential savings will be in vain,” he concluded.